Virtually every jurisdiction today is busy developing private international law rules to deal with trusts and similar ring-fenced structures. With the increasing impact of globalisation, business interests throughout the world are intent on maximising the potential of such structures for raising funds, lowering risks, and cutting costs. As a result, numerous complex issues involving the traditional categories of settlor, beneficiary, and fiduciary are being radically transformed. 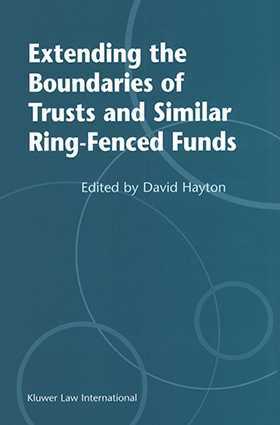 Extending the Boundaries of Trusts and Similar Ring-Fenced Funds offers valuable analyses, by sixteen well-known authorities in the field, of a broad range of trust-related issues. The many important insights in this book reveal the workings of such issues as the following: the disappearing divergence between common law and civil law jurisdictions in the matter of trusts; using the segregated fund concept to manage the risk of insolvency; the demise of the "amateur trustee" in the charitable trust sector; why loss to the fund supersedes particular losses of beneficiaries; the legal dimensions of hiding ownership by "giving" property to trustees; the intervention of public policy in questions of perpetuity; the selective imposition of OECD and FTF transparency initiatives on offshore jurisdictions; and "policing" of trustee behaviour by beneficiaries. Lawyers, bankers, and others dealing with investment and business finance will find much information as well as food for thought in this fascinating book, as will those involved in the traditional trust industry, whether as trustees or lawyers or fund managers. Most of the essays in this outstanding thematic collection were originally prepared for presentation at a conference held in 2001 at King's College London.